Yesterday an amazing thing happened and today another amazing thing happened. Yesterday a daughter won a Free Popsicle, and today I won a Free Popsicle. I have never won anything before (apart from being the millionth visitor of several websites) so I am very proud. Slurp slurp, we went respectively, biting and licking all the ice off, and then to our utter surprise each of us discovered that the freshly exposed stick told us we were Winners. This proves than my genetic material is superior to yours, whoever you may be, because two Popsicle Winners in two days cannot be a coincidence. It has to be skill. Unf. we have to claim our prizes before 28.02.14 and aren't allowed to do so at a supermarket, which is the only place I know that supplies Popsicles. So I shall make them into a star and we can wear it when the Queen has one of her functions and the invitation demands Medals will be Worn. Mr. Knight's mother and Karen Holliday can wear their MBEs, and Jane and I shall wear our Popsicle Sticks. I glued the two pieces of mast step together to make a short wooden double-tube, the measurements taken off the Optimist, the glue left to set in the sun with a cluster of clamps to hold everything flat. And then using the same clamps I glued it to the prong thingy that will stick out of the side of the boat. And then I chiselled and flap-wheeled it to an artistic Shape. And then I drilled holes in the recesses so that any water can drain out. And I carved and chiselled two more prong thingies that will stick out of the side of the other half-hull, to which eventually can be fitted a rudder. And using a paintbrush I slapped epoxy wood sealant all over them in my usual carefree manner, and hardened them in the sun. This was a Mistake, as the air inside the wood expanded and blew lots of little bubbles. And I mixed HT120 glue powder into some of the surplus epoxy sealant to fill in bits of missing wood and this was another Mistake because it unexpectedly turned into a rubbery lump. And the extra bit of wood glued in place with it was so feebly attached I could prise it off afterwards with my fingers. So we conclude sealant has to be used as sealant and not as cheap epoxy glue. 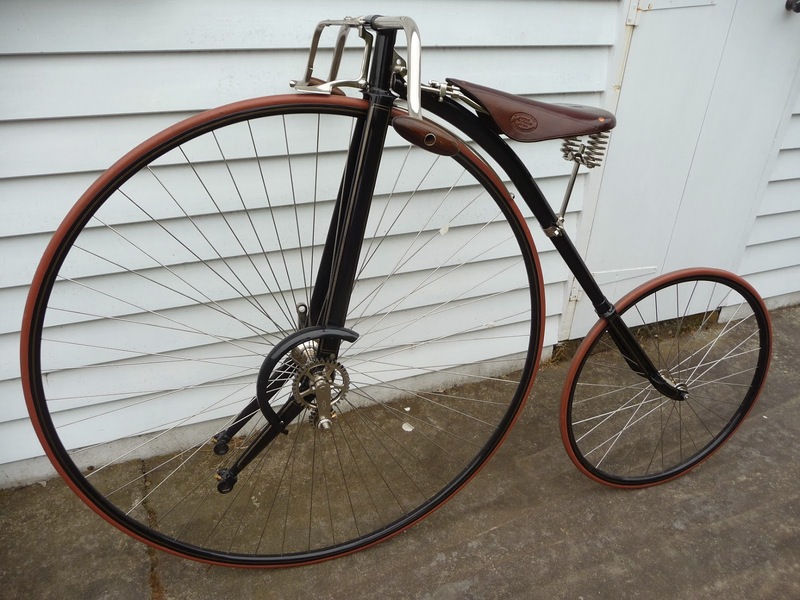 Now Mr. Knight has spent the last month undermining all this devoted assiduity by feeding me dribbles of information concerning the famous Facile bicycle, gently reminding me that I was to receive a 36 inch rim and tyre and tube and spokes, and the only sensible thing to do with such things is to make one. By way of preparation I made a spindle for it out of an old bottom bracket axle. I removed the case-hardening by twizzling it against the bench grinder and machined an arbor out of a knackered crank. Theory and practice diverge when I'm in charge, and it didn't work. The axle was all over the place when put back in the 3-jaw. So the ends weren't as perfectly in line as they ought-to-ov been. Mind, there was plenty of clearance between axle and bearings in that red trike I fixed for the armless judge. so I could cut and widen an old BB axle. I did think of using the top BB axle, which is hollow and therefore easier to align. It is, however, made by Campagnolo and Mr. Knight would have died of shock if I had. Luckily yesterday Jim telephoned to say a complete 36 inch wheel had arrived so I don't have to worry about a spindle, and here it is, spectacularly enormous and weighing a hefty eleven pounds. And because I got it through the local bike shop and not on the Internet where I would've been the millionth visitor, it was a hundred dollars cheaper. Fourteen gauge spokes, bearings already fitted, flanges four inches apart, and an industrial grade 32 psi 2 ¼ inch tyre that looks - well - heavy. I have read Mr. Knight's blog, and do not propose to spend the remainder of my life building a museum-perfect Geared Facile, so it will have to be the simpler Lever Facile. This doesn't need a hole through the axle and it doesn't gear the front wheel up and it isn't as satisfying to watch when being pedalled, but it is much faster. - Why faster? - because speed = distance ÷ by time, and I bet a Lever Facile can be welded together out of old junk in a month or two while a Geared Facile, as we have daily proof, can't. - This is a paradoxical aspect of travel that was first explored by Thoreau, who in about 1840 pointed out that by the time you have earned the rail fare to Fitchburg, he has set off walking and is already there. Ivan Illich, similarly, showed that by the time you've earned the money to pay for your car, and insurance, and tax, and maintenance, and fuel, and paid the taxes to support the local spinal paralysis unit, and actually driven it you're travelling at no more than five miles an hour. - Well it isn't actually a paradox at all - cars are grown-ups' playthings, as we all know. Nobody had them 200 years ago, and the world didn't end. I did some drawings of the levers and for reasons indicative of my stupidity I got all the maths wrong so I'm going to have to do this again, quite a lot of times, probably. The humiliating thing is that it isn't even maths: it's just arithmetic. Mr. Knight's Facile has a forty inch wheel which his planetary gear system cunningly turns into a sixty inch wheel. My idea of gearing derives from the fact that standard bike cranks are 170mm, and a complete rotation makes a vertical movement of fourteen inches. A comfortable gear is to pedal one rotation along a flat road as if the wheel is somewhere between 54 inches (lazy slow riding) and 66 inches (not working up a sweat on the flat). So battle is now joined. No, not between Mr. Knight and me, silly; between getting on with the proa and starting a fake and hideous (I guarantee it will be hideous. This saves Mr. Knight having to) lever Facile welded together out of old BMXs.